Management Training — in ever-new garbs — is big business, possibly the very biggest, in the training arena today, ever since it was started off in the early 20th century in America. Its dernier cri is ‘Human Resource Development’, as if human beings were insentient “things” to be “developed” like a piece of real estate! In India the business revolves round parroting theories and aping techniques spawned and practised in the West, trying to transplant alien concepts and practices into an ethos whose very basis and substance are radically different. The results of this wholesale importing have been not only discouraging but on several occasions disastrous. The enthusiastic propagation of the “T-group”, hastily abandoned by Indian companies in the 1960s disconcerted with the sudden turnover of middle-management personnel that followed, is now attempting a come-back in the new guise of “Applied Behavioural Science Laboratory”. Once again the human being is brought down to the level of a guinea-pig. MBO [Management by Objectives] came and went with the euphoria of a Madura Coats case-study as it failed to take into account the need for individual transformation. Theory X and Theory Y, the Hierarchy of Needs, the Hygiene and the Motivation Factors, Organisational Development — every western con cept and its inevitable camp-follower, the techniques [e. g. the Management Grid, Firo-B, Johari window, Thomas-Killman Conflict Resolution Mode, Transactional Analysis, Interactive Skills, Quality Circles, Sensitivity Training, a plethora of simulation games, Action Learning] were quickly picked up by Indian entrepreneurs intent on making a quick kill and marketed assiduously. Blooming like hot-house plants, they withered away as swiftly. Despite the existence of several national management institutes manned by Indians, the vision remained obstinately blinkered and wholly Harvard / Tavistock / Manchester Business School oriented. The concept of evolving from within the Indian matrix a system of managing the self and of self-development peculiar to Indians appeared to be something so utterly alien to the intellectual equipment of the Management Schools that no organised attempt was made in this direction. The 1980s saw the glimmerings of a new light creeping over the murky training horizon shrouded in clouds of western fumes and the next decade heralded the dawn of a new birth: of a concept and a technique which are our very own, which have existed over the millennia as sanatana, eternal as man’s very soul, which is not circumscribed by geographical and temporal boundaries but can span the continents to reach the innermost being of anyone who desires to evolve into a Manager, a human being who manages himself, and thereby influences his environment. The watershed in MAN-agement development, which is in essence the growth of the individual human being, has come about through the tireless search of a professor of financial management and MBO who asked himself why this country, with one of the oldest living civilisations in the world, should not be able to provide the answers foxing management experts frenetically grafting foreign techniques onto Indian minds and finding them failing to fructify in their hearts. This delving into the heart of our heritage for a solution to the modern problems did not start in thegurukuls of the north or the ashrams of the south with their repository of traditional wisdom but in Calcutta. Perhaps this was quite in the fitness of things. For it is in Bengal since the 19th century Renaissance that the questing soul has dived into the still oceanic depth of our sanatana heritage to come up with pearls beyond price in the work of Ram Mohun Roy, Iswarchandra Vidyasagar, Bankimchandra Chattopadhyaya, Sri Ramakrishna, Swami Vivekananda, Rabindranath Tagore and Sri Aurobindo. This attempt took the shape of Management Development Workshops on “Management Effectiveness and Values Systems: Indian Insights” by Dr. Sitangshu Kumar Chakraborty, professor at the Indian Institute of Management, Calcutta. 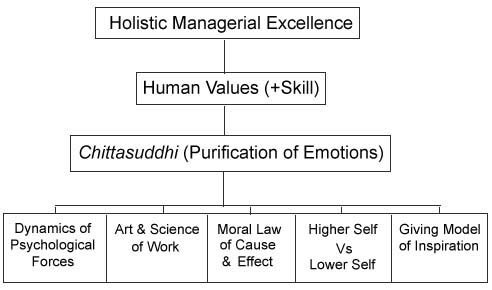 The concept is based on the postulate that whereas the characteristic of management training curricula is obsolescence of topics and techniques, human values endure the flux of change. These are workshops focussed on the mind and the individual, working with the mind for the mind on the mind. Over 8000 participants from nearly 40 private and public sector organizations located in different regions of the country have participated, and the results documented in books published by Tata McGraw Hill, Wiley Eastern, Himalaya Publishing, Wheeler, Rupa, Oxford University Press, Sage, ICFAI University. I was the first and, for quite some time, the only government bureaucrat to have attended these courses. The only government organizations to have gone in for the workshop are also from West Bengal, namely, the Directorate of Industrial Training, the Administrative Training Institute and the Health Directorate. The National Academy of Administration, Mussoorie, restricted itself to sending a couple of faculty to attend the annual international workshop at the MCHV. the giving model of motivation. This module starts with the basic question: How to increase organisational effectiveness? It is followed by an input on the relationship between Values and Skills. Generally, skills are over-exercised and values are neglected. If values are not in good order, high order skills will be used in malicious, destructive ways. mindful breathing concentrating only on slow, deep (fully filling the chest and stomach), silent breathing through alternate nostrils without holding the breath in or out, the exhalation and the inhalation being equally slow, for 10-15 cycles in a seated posture on a chair (in case sitting on the floor is uncomfortable), the spine kept erect, the feet planted firmly flat on the ground eyes closed. This pranayama helps to centripetalise the centrifugal mind that is constantly dissipated outwards. imagine breathing in a sattvik quality and breathing out a rajasik or tamasikone. These two steps are drawn from Patanjali/Raja Yoga. imagine that the brain space is empty, a void, using the image of a clear blue sky, and experience a sense of peace, freedom. Thoughts that come are imagined as clouds floating across the sky, without paying attention to them. A helpful image is imagining the head as a tightly corked bottle and uncorking it to let out all the effervescent fizz, leaving behind a calm serenity. In the third step of this exercise one silently repeats “Let go” while exhaling to aid bringing calm serenity to the mind. imagining opening up an entrance at the crown of the head, like the mouth of the body-bottle being uncorked, with the aspiration for the Universal Energy-Consciousness-Bliss to descend into one’s being, using the image of a many-petalled lotus at the top of the head blooming in the morning sun’s rays and welcoming that radiance into itself. These two steps are taken from Sri Aurobindo’s Integral Yoga. I am Eternal Consciousness, luminous, pure, complete and Blissful. This luminous sphere is the Higher Self with which identification is sought. The concept is taken from Jnana Yoga, aiming at replacing the hunger for having more by the idea of the self being innately complete and full. Concentrate on the luminous bluish-golden sphere within the heart-cave and bringing into its effulgence all the good and the bad inside oneself, imagining that this radiance is suffusing every nook and cranny of the cave, cleaning it up. An alternative is to imagine one’s chosen deity seated here and offer up to it all that one is, in total surrender. This concept is taken from Raja Yoga and Bhakti Yoga. The afternoons are occupied with studying selected readings such as Sri Aurobindo and The Mother’s Right Attitude to Work, On Self Perfection, Living Within, Growing Within, Swamy Vivekananda’s The Secret of Work, Rabindranath Tagore’sSadhana, Personality, Shantiniketan. Participants are urged to maintain silence throughout to assist consolidation of experiences, introspection and internalization of the concepts. For the next three to four months the participants are requested to hold fortnightly meetings, with a rotatory leadership of each session, in which these exercises are repeated and the experiences written down individually, including problems that come up in applying the concepts in daily life at home and in the work-place. Each individual is also supposed to do the exercise every morning and night by himself. The Indian concept of leadership is based on the ‘Rajarshi’ model which is a combination of “Raja” and “Rishi”. Rishi (seer, visionary) is the base and Raja (who ensures the happiness of the people) is the superstructure. a) Gives priority to ‘ROLE’ over ‘SELF’ (e.g. role of Raja in Sri Ram in the Ramayana while banishing Sita). b) Translates cosmic order into social order. Cosmic order has four components: wisdom, power, protection and work. These were translated into – Brahmins, Kshatriyas, Vaishyas and Sudras. c) Has solitude, silence and sincerity in his character. Imagine radiating from the psychic centre waves of rays of peace, harmony and bliss to everyone, friend or foe; imagining sharing one’s inner serenity with all without exception, particularly those who are antagonistic (pratipaksha bhavana) without any expecta tion of any sort of return. This concept is taken from Buddhist psychology and linked to Karma Yoga. These uses of the dynamic imagination are Prof. Chakraborty’s own creation. 1. Annamaya Kosha: The outermost material sheath. 2. Pranamaya Kosha : The vital life force and protected by the Annamaya Kosha. 3. Manomaya kosha: The mental sheath. 4. Vijnanamaya kosha: The wisdom sheath. 5. Anandamaya kosha: The sheath of bliss. Stress belongs to the first three sheaths i.e. from Annamaya to Manomaya kosha. The remaining two i.e. the Vijnanamaya and the Anandamaya koshas are absolutely stress free. Our problem is that we jumble up these five sheaths and thereby stress is produced. capture the awareness of unity. The common factor in all the four quadrants is the differing nature of values. 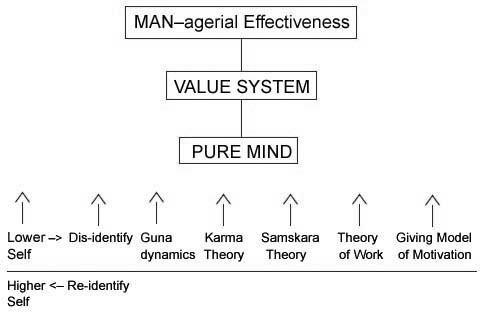 Therefore, the operative objective is to bridge the gap between weak and strong values, to increase sensitivity to and sustenance of values founded on interiorisation of discipline (the centripetal process) using mindful breathing; and Mind Purification or chittashuddhi. These are opposed to the relentless exponential process of exteriorization (the centrifugal tendency) which is the existential situation for mankind, egged on by increasingly higher standards of consumption imposed by the Consumer Society. The individual consciousness is being constantly plucked out of the centre of one’s being by relentless application of all the tricks of Consumerism. This leads to a harried life-style which creates an environment hostile to the growth of sensitivity to values. Hence the need of a counter-balancing movement, a centripetal revolution. The management of breathing, our most existential activity, the conscious control of our breath, is the starting point of the management of self that is the secret of self-control. The question is, how does one build up the storehouse of wisdom of self-knowledge on the foundation of the mind which is a collection of seventeen defilements such as greed, covetousness, malevolence, anger, malice, hypocrisy, spite, envy, stinginess, deceit, treachery, obstinacy, impetuosity, arrogance, pride, conceit, indolence? Hence the need for chittashuddhi, purifying the foundation. “Mind” here is an inadequate translation of “Chitta” that embraces emotions, feelings, impulses as well as thoughts. The concentration has to be not on sharpening the intellect, the reason, but on purifying the vast emotional area that is infra-rational, underlying the veneer of rationality. Man is primarily driven by emotions that use the intellect as an instrument. As Sri Aurobindo pointed out, “human reason is a very convenient and accommodating instrument and works only in the circle set for it by interest, partiality and prejudice.” Bertrand Russell had warned, “Even more important than knowledge is the life of emotions.... given knowledge and competence combined with folly, there can be no certainty of survival (of the human race).... It follows that unless men increase wisdom as much as knowledge, increase of knowledge will be increase of sorrow.” Again, Einstein pointed out “The intellect has a sharp eye for methods, and tools, but it is blind to ends and values”. 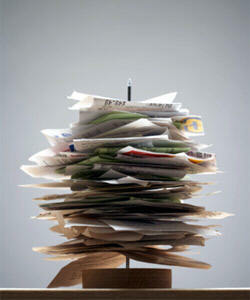 Brain-storming becomes most effective if preceded by brain-stilling. This is the flute of the heart and mind of the individual that Tagore speaks of which has to be cleansed of impurities so that the music of the Creator can flow through it. This is the aim of the exercises described above.